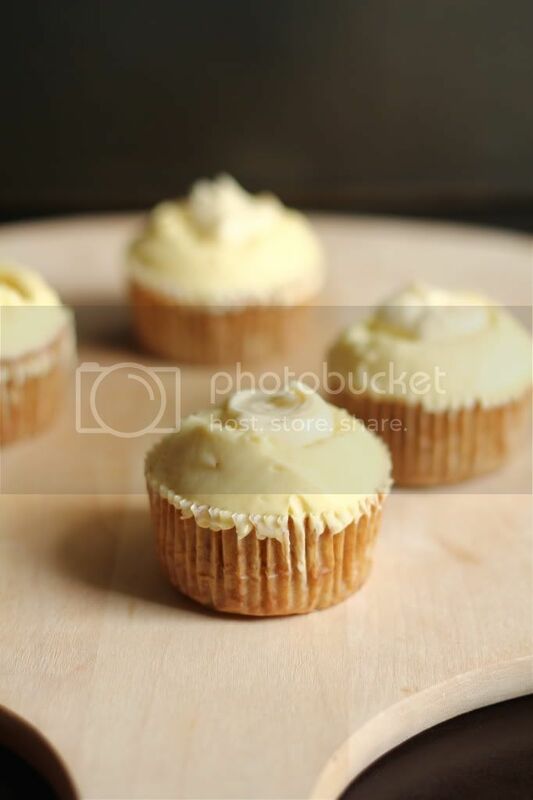 Crumbs and Cookies: vanilla cupcakes with mango swiss meringue buttercream. 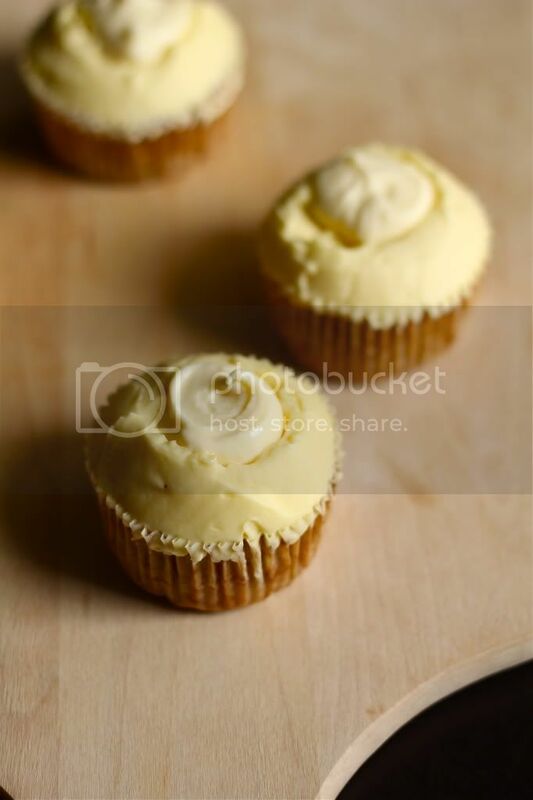 vanilla cupcakes with mango swiss meringue buttercream. I need to rant and curse about the buttercream. I didn't decide on a swiss meringue one at first. I was actually intending to make Rose Levy Beranbaum's neoclassic buttercream which is someone like an italian meringue buttercream with egg yolks. I didn't incorporate the sugar syrup properly and ended up with a fine sugar structure around the whisk of my mixer. And delicious sugar chunks in my egg yolk soup. Trash bin. Because I had an egg white left, I decided to make a swiss meringue buttercream instead. So I warmed, whipped, plopped in the butter and beat in the mango puree. The mixture didn't curdle, which I took as a bad sign because it was soupy instead. The butter was too warm. I thought hey, no big deal, just refrigerate it and whip it up again. And so I did. For about 5 or 6 more times. I was so frustrated. Every time I took it out from the fridge to whip, the mixture would firm up, disintegrate into yellow curds then disintegrate into soup with strands of silky butter. No matter how much I persisted, the best I could do to salvage it was to whip it back into its original stage of uniform soupiness. I tried the whisk attachment. I tried the paddle attachment. I added in more butter. Heck, I even refrigerated it overnight. Nothing worked. I was about to give it one final shot before giving up when I gave the buttercream some serious thought. It's all about emulsification right? There has to be a way to force the water back into the butter after it curdles. And then my mind sort of drew a link- emulsification= immersion blender= maximum contact between blade and mixture. Up till then, I had been using the large mixing bowl for the stand mixer to make my small batch SMBC. I noticed that even though it was a scaled down quantity, it's not necessarily faster to make because there's lesser buttercream coming in contact with the whisk. Most of it would just migrate to the sides of the bowl and stay there until I scrape it down. So I switched from the mixing bowl to my glass measuring jug and cranked up the speed of my hand mixer, buttercream pre-refrigerated again. At first it went through the same process as it did with the stand mixer and when it came to that butter-strands-in-soup stage again, I bit my lip and carried on. For a few moments, there was just me and that buttercream. Please work please work please work. And by some miracle, the buttercream began to firm up. It graduated into a very-finely-scrambled-egg stage, then lo and behold, a silky buttercream! I was so happy. I couldn't believe that I'd succeeded that I even held the buttercream up to the light to check if it was properly emulsified. And it was, thank goodness! I would collapse if it wasn't. So there you have it. A less well-known reason why your SMBC probably didn't work- because your batch was too small to use a stand mixer. BUT as much as I'm complaining about making the buttercream, I absolutely loved every single bite of it. The taste of mango was distinct and it wasn't too buttery because I reduced the butter. It's one of the best buttercreams I've ever tasted. Promise. The only slight problem I have with it is that it doesn't firm up rock hard like regular buttercreams in the fridge, which is sad because I love that consistency. Kinda reminds me of eating ice cream straight from the freezer. Now on to the cupcakes. I have to say that I thought that I wouldn't like these very much, based on their appearance after baking. Unfortunately, I almost always eat with my eyes first and visually unattractive cakes often get marked down without even being tasted. It's not noticeable because the cupcakes have been frosted but two out of the four were sunken in the middle. Also, all four of them had splotchy brown patches on the surface. The sinking could be due to my overzealous whipping of the eggs, resulting in too much air incorporated. Despite all that, these cupcakes taste great! They were of the perfect sweetness and the amount of salt added was on point. They were on the dense side, but extremely moist. I've made quite a few vanilla cake recipes so far and I realize that I prefer one made with butter. I definitely recommend trying this recipe if you're looking for a vanilla cake recipe using oil though. Combine cake flour, baking powder, baking soda and salt. In the bowl of an electric mixer, beat the eggs for about 10 to 20 seconds. Add the sugar and continue to beat on medium speed for 30 seconds. Add the vanilla and oil and beat to combine. Reduce mixer speed to low and add half the flour mixture. Add the buttermilk then add in the rest of the flour mixture. Beat until just combined. The batter will be thin. Divide batter amongst paper liners, filling them about 2/3 full. Bake for 12 to 14 minutes. Let them cool completely before frosting. Heat egg whites and sugar in a mixing bowl over a pan of simmering water until sugar dissolves, about 2 to 3 minutes. Remove from heat. Using your electric mixer, whisk on low speed until foamy. Add cream of tartar and whisk on medium-high speed until stiff glossy peaks form and mixture is cooled completely, about 10 minutes. Reduce speed to low and add in the butter 2 tablespoons at a time, beating to incorporate fully after each addition. Don't worry if the buttercream appears curdled at this point, it will become perfectly smooth again. After beating in all the butter, beat in the mango puree. Keep beating until the mixture is smooth and spreadable. If your buttercream still remains soupy, it is too warm and needs a bit of chilling. Maybe around 15 to 30 minutes in the fridge. Use immediately or refrigerate in a tightly sealed container for 3 to 5 days. Is your fruit puree fully incorporated? 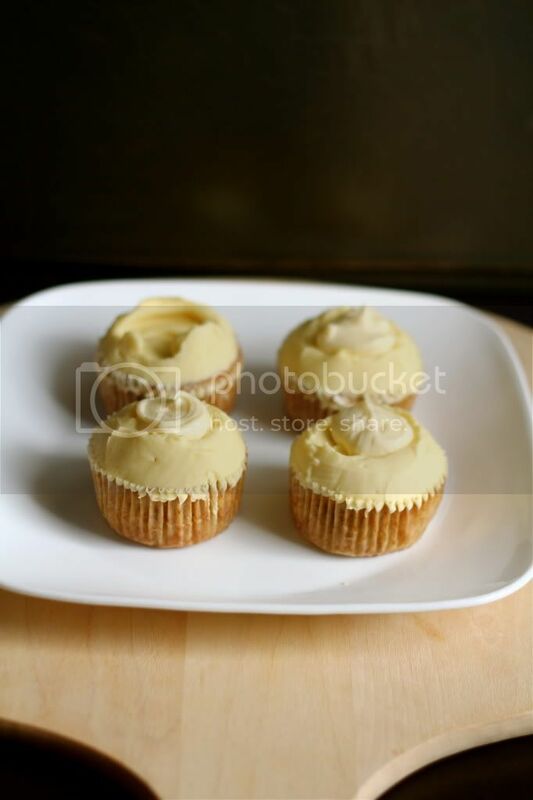 Because I tried it with peaches and you can still see the tiny "chunks" in the buttercream. Hi there! Was your peach puree completely smooth? That could be the issue. Maybe the canned peach in a syrup I used were the reason why it didn't want to blend with the butter? I don't think using canned fruits would cause them to be unable to blend in homogeneously with the butter. Perhaps next time you could try straining the puree before you incorporate it? My egg white/sugar/tartar mix never got to proper, stiff peaks, even after 13 minutes... I was afraid to go much longer. Should I just keep going until I get there, no matter how long?